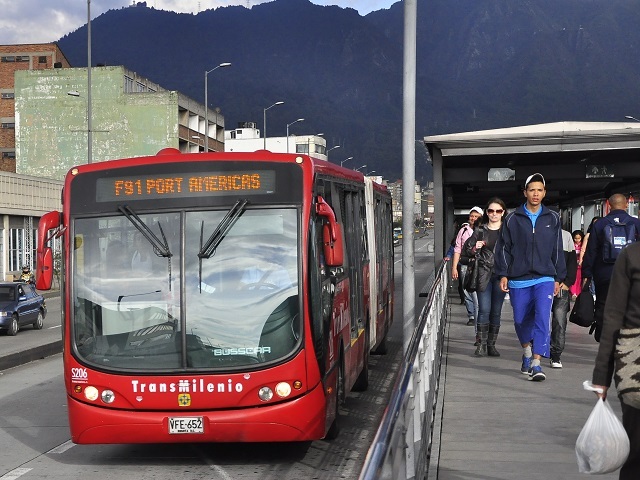 The TransMilenio bus rapid transit (BRT) system in Bogotá, Colombia (pictured above) is one of the leading examples of sustainable transport worldwide. The city is currently considering subsidizing student fares. Photo by Mariana Gil/EMBARQ Brazil. Subsidizing users’ fares for public transport may sound like a great idea, and often there are good economic reasons for doing so. In all industrialized and many developing countries, urban transport systems are subsidized with public funds in order to continue operating. It sounds even better if subsidies target certain populations, such as students, older adults, or low-income communities. For example, Bogota, Colombia gives subsidies to low-income individuals, people with disabilities, and seniors, and is planning to expand support to students, according to a draft ordinance recently approved by City Council. There are two important points to keep in mind about transit subsidies: 1) subsidizing users’ fares, particularly with targeted subsidies, is effective; and 2) discounted fares for particular populations should not be funded by charging other passengers more. By focusing on both sides of the equation, city leaders can ensure an efficient and sustainable transport system. The debate on transport subsidies has a long history in discussions of transport economics. According to new research from Leonardo Basso and Hugo Silva, subsidizing user fares has been shown to increase ridership, which in turn increases the frequency of the entire system and reduces waiting times for all users (known as the “Mohoring Effect”). Additionally, by shifting people to more sustainable modes of transport, subsidies can help address the negative externalities of car use—like traffic congestion, air pollution, and fatalities (known as “The Second Best” principle). Furthermore, subsidies can be redistributive, meaning that they benefit lower-income individuals. These are all compelling reasons for subsidizing users’ public transport fares. However, problems can arise when subsidies are not properly applied. If subsidies do not improve the quality of service or fail to help those in need, they lose their impact. Implementing targeted subsides should be a redistributive measure, as they are an effective solution for increasing access to public transport among disadvantaged communities. Subsidies need an external and sustainable funding source. The average user should not be required to pay a higher fare to cover the cost of other users, as this type of measures only discourages the average person from using public transport. It is like charging parents more to pay for the fare of their children. This decreases overall demand and burdens everyone financially. Unfortunately, this does not seem to be the case in Bogota’s draft ordinance aimed at reducing students’ fares. Therefore, it is necessary to find alternative funding sources for transit subsidies. For example, one logical option is to subsidize student fares with education funds, because access to education is connected to the availability and quality of urban transport. Similarly, subsidies for low-income communities, older adults, and users with disabilities can come from the budget for social services. Alternatively, funding could come from taxes on inefficient car use, since private vehicles often do not pay for the full amount of their social cost—which includes traffic congestion, air pollution, and crashes. All these sources of funding can help ease the financial burden on transport budgets. Initiatives to subsidize public transport fares should be sensible and balanced. The intention to subsidize the transit fares of marginalized populations is good, but without the proper financing mechanisms, transport sector deficits will only grow. Ensuring an efficient and sustainable public transport system requires not only supporting particular communities, but doing so in a financially viable way. Versions of this blog were published in Spanish here and here.